Sherman, Francine T., and Annie Balck. Gender Injustice: System-level Juvenile Justice Reforms for Girls. Report. Law School, Boston College. September 2015. Click image to read full report. 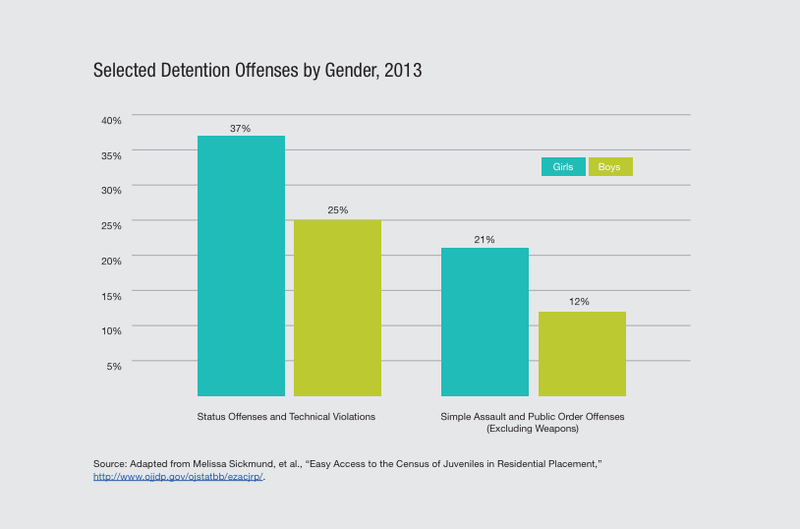 Girls have often been left out of the studies of the juvenile justice and welfare service systems. Despite their increasing proportion in the systems and the many challenges they face within them, girls are also often excluded in discussions on reform. 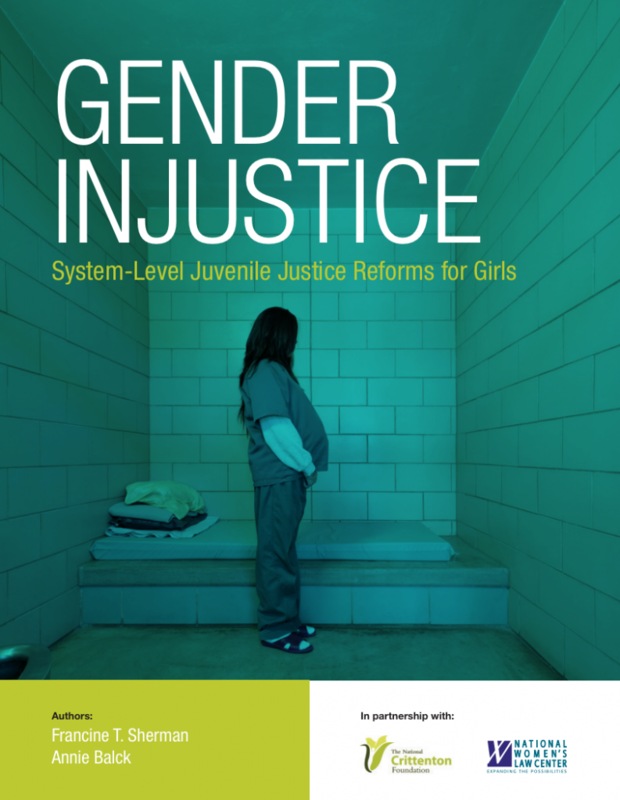 Written by Francine Sherman and Annie Balck, Gender Injustice: System-level Juvenile Justice Reforms for Girls identifies the areas in these systems where girls are being disserviced and how their particular needs are overlooked. This report strives to remedy this gender injustice by mapping girls’ current paths into and through the juvenile justice system. It looks at the social contexts driving their behavior and involvement in the system, while providing recommendations for alternatives to punishing girls for challenges beyond their control. Beginning with a brief history of the juvenile justice system, the report sets the basis of the problems within the system in its tendency to over-intervene. Its “protective and paternalistic” approach fails to divert girls away from detention at each system decision point (e.g. arrest, petition, detention, and disposition). This pulls girls deeper into the systems for what are often minor offenses or violations rather than directing them to productive interventions. The report holds that, if its recommendations are applied, the juvenile justice system can be redesigned to protect public safety and support the healthy development of girls. The recommendations are focused on providing gender-responsive, culturally-informed supports for girls exhibiting behaviors currently dealt with in punitive measures. This is important because those behaviors are very often the result of traumatic and unhealthy contexts. Citing existing policy, programs already in effect, and the states that have benefited from them, the recommendations can be summed up in two steps: reduce justice system involvement and use a developmental approach to meet girls needs. Francine T. Sherman is an attorney and Clinical Associate Professor at Boston College Law School, where she has been teaching Juvenile Justice and Children’s Rights and Public Policy for over twenty years and where she founded and directs the Juvenile Rights Advocacy Program (JRAP). Professor Sherman speaks and writes widely about the juvenile justice system and, in particular, about girls in the juvenile justice system. She regularly consults with foundations, federal, state and county governments, and judges on issues related to girls and the justice system. She is a consultant to the Annie E. Casey Foundation’s Juvenile Detention Alternatives Initiative on detention reform for girls. Professor Sherman has testified before Congress, served on a U.S. Department of Justice National Advisory Committee, and advises the OJJDP National Girls Initiative. Annie Balck is an independent writer, editor, and consultant who has been working on behalf of at-risk and disadvantaged youth for nearly 15 years. Prior to working independently, Ms. Balck held staff positions at the National Juvenile Justice Network and Children’s Law Center in Washington, D.C. and was a student attorney in the Juvenile Rights Advocacy Program at Boston College Law School. Ms. Balck has a juris doctor from Georgetown University Law Center and a bachelor’s degree in English from the University of Michigan.